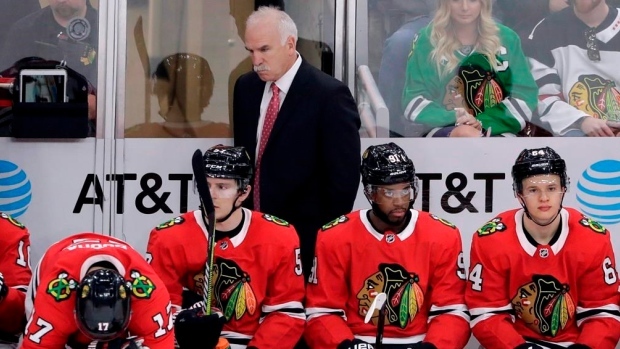 Three-time Stanley Cup champion Joel Quenneville says he is interested in coaching again, four months after being let go by the Chicago Blackhawks. "It's been a while now since we've been behind the bench, so I think there's an appetite as we go along here to get back into the game," Quenneville told WGN9 Chicago on Sunday at a Blackhawks alumni charity event. "I try to not watch as much Blackhawks as I used to, but I watch most of the games. It's been a great race and it's going to be fun to see how it all plays out. "We're in no hurry right now. We'll see how things transpire in the off-season. We'll have to think about it and we'll see." Quenneville, 60, was in his 11th season with the Blackhawks when he was fired on Nov. 6 following a 6-6-3 start to the season. He made the playoffs in all but one season with the Blackhawks, when the team posted a 33-39-10 record last year. "I think in our business there's not too many surprises anymore," he said. "I was privileged to be in Chicago for 10 years. It's part of the business, I understand all that. I know when I exited other places, the bitterness; the animosity was at a different level. And here the memories were so special and so good, and the people here were so special to me and my family that it was tough, but they made it all like... I never [had the opportunity to] thank the fans since I left, but I've got nothing but appreciation and admire all they've done and supported our team and our experience in Chicago." Quenneville has worked 1,636 career NHL games behind the bench with the Blackhawks, Colorado Avalanche and St. Louis Blues. He is one of seven coaches to be fired during this season.